The beliefs, philosophy and concepts of the Kindred Spirits Project seems to be evolving in the collective consciousness of society recently. My dear friend and colleague, Dr. Marc Bekoff has recently shared in his blog post about the creation of the new National Museum of Animals and Society in Southern California. With all the museums in the world honoring so many worthy causes, movements, art and history, I am so thrilled to see the creation of this new Museum of Animals and Society. NMAS even has a tour titled Souls that Awaken Us and can be found on their Facebook page. This museum, NMAS, is another physical manifestation of the vision of acknowledging a new level of awareness and connection between humans and animals. It has been an ongoing evolutionary process, back to the future, so to speak, acknowledging the vast, intimate interconnectedness between humans and nonhuman animals and all living beings. It seems so obvious, yet, in a society where technology, competitiveness devoid of ethics and morality, darwinian capitalism and survival of the fittest seem to be the dominant themes, the healing power of human, nature, animal connections seem to have been less honored and acknowledged for their vital part in a healthy society. Years ago, the Harvard based entomologist, E.O. Wilson termed this connection “biophilia”, the inherent love of all living beings. I discussed this subject as one of the foundations of my book, “Kindred Spirits”, over ten years ago. This has began to evolve into a relatively new field of called anthrozoology that is focused on research on the nature of humans-animal interactions. It is exciting to see how this field is gaining a good deal of momentum from researchers representing many different disciplines. These days it can be challenging not to become disheartened by all the pain and suffering occurring to animals and humans throughout the world. It is a joy to see some positive acknowledgements about the importance of nature and animals in the survival of our world. I am grateful that we can all be part of this new awareness and each of us bring this awareness to all our friends and our communities. Check out these new worlds and museums and spread the great news! Happy Easter, Happy Passover, Happy Spring and with the new buds and flowers blossoming outside, may new love and light blossom within each of us and be of benefit to the world as well! This past March, Vancouver pioneered a new approach to living together with their Vancouver Conference on 12 days of compassion based on the charter for compassion. I am grateful to share with you this Video of Karen Armstrong’s keynote Lecture on the Charter for Compassion. Karen Armstrong is a world renowned historian of religion, author, professor and winner of the TED Prize for her development of the Charter For Compassion. This is sponsored partially by the Greater Vancouver Compassion Network (www.gvcn.ca) as well as the Simon Fraser University Center for Dialogue and the Dalai Lama Center for Peace and Education. The Dalai Lama sometimes describes compassion as a generosity of heart. This is all part of a new movement for a Network of Compassionate Cities. The one thing I would add to this discussion of compassion is that they include compassion for all beings to include the animal kingdom. When this happens, perhaps the oil companies will no longer use sound frequencies that have been found to kill dolphins, whales and other marine mammals, poachers will no longer kill elephants, rhinoceros, primates etc. and factory farms will no longer treat animals like objects rather than sentient living beings. I feel like this is part of synchrodestiny. 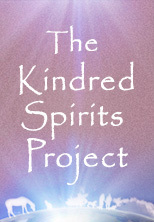 I was unaware of this network when I felt guided to begin my Kindred Spirits Project blog. With my background as a veterinarian committed to doing my best to help animals and their human caretakers, guided by my search for what is ultimate healing, I had found myself on a subconscious quest which has led me to my own insights that compassion for all beings is one of the keys to heal the human condition and its disastrous impact on our environment. I personally feel that by practicing unique mind body medicine techniques that I have developed for all animal lovers, animal hospitals, animal shelters, sanctuaries, zoo’s, aquariums, and any place where animals and people connect can actually become center for the awakening of compassion for all beings. I will be sharing these techniques more in the future on this blog, in webinars, books, as well as various conferences for veterinarians and animal lovers. Stay tuned. I will keep this post short so that you can utilize your valuable time watching this special presentation at the beginning of the 12 days of compassion in Vancouver. Let’s expand on this develop a network of compassionate cities and compassionate animal care centers throughout the world! What do you think? Happy Valentine’s Day to All Kindred Spirits! Warm Wishes for a Joyous Valentine's Day to All Beings! Wishing all Kindred Spirits a Happy Valentine’s Day! May all beings feel the deepest, profound love that permeates all of life, all dimensions! This love is within each and every one of us. It is not getting love from food, treats, distractions, etc. It is giving and receiving love from the deepest truth of who we really are. This love radiates from our hearts in every moment. Love is the bridge between all of us, between the form and the formless, between all hearts. Love is a key to the trans-species field theory and global coherence. It is our old programmings, thoughts, belief systems etc. that prevent us from realizing this. From this deep love, I wish you all the love that the kindred spirits project wishes to radiate out to all our wonderful followers! I chuckle sometimes when I read studies that document what some might think is soooo obvious. It is nice to see though that science continues to document the beneficial impact of positive thoughts and intentions that ancient traditions and modern psychology discuss at length. This particular study on the benefits of good intentions is one of those studies. It seems like one of those “duh” moments. Of course good intentions make us healthier and happier. Neuroscience continues to document how our positive thoughts, intentions and emotions are not only of benefit to our own body, mind and spirit, but also have significant impacts way beyond us, to be of benefit to all beings we encounter and thereby to all beings that are encountered by the beings we encounter and on and on. So simple, yet so challenging. As I wait to board a flight back east to see my patients and their humans, I get great joy by consciously thanking flight assistants at check-in, the security personnel, cashiers, etc. who are all just “doing their jobs”. They immediately smile as they feel recognized and acknowledged as a fellow living human being, not just an automaton. In reality, all of us, two-legged, four-legged, winged, domestic and wild, all we want is to be acknowledged and loved. It truly is as simple as that. If we have positive intentions and express them to everyone we encounter, we can and do indeed make a difference in the world, being by being, moment by moment. When I enter a horse barn or an animal hospital, I do my best to smile, (most of the time) even during more challenging personal moments in my life. That smile inevitably shifts to a more positive energy in the environment. Neuroscience is documenting how mirror neurons, mirroring others visual images of each other tend to reflect back to us often what we are reflecting to others. Once we realize this, it might seem sensible, that we can consciously choose, as often as possible, to have helpful, positive thoughts and good intentions. We truly are mirrors for each other. We can be like that dark mirror in the Harry Potter movies, or we can consciously choose moment by moment to have good intentions and be a positive mirror to the world. Good intentions stimulate good vibrations! So as the Beach Boys used to sing…”Good, Good Vibrations”, let us all have good intentions and good vibrations! Is this not what our animal friends stimulate in us and do for us when they whinny, purr, wag their tails, and show us their joy when they see us? Let us wag our tails, whinny and purr and bring joy and good intentions to others! Let’s support the findings of this study day by day. A number of synchronistic musings about wealth and happiness came across my path these past two weeks. These days there has been so much talk about the economy and the challenges of 2012 and onward. It seems somewhat ironic that the financially wealthiest individuals in the world have gathered together at the World Economic Forum in Davos Switzerland to discuss austerity measures for the rest of the world. It has been acknowledged that much of the global financial corruption is by in large the cause of the economic collapse resulting in prescribed austerity measures for the middle class. It stirs up questions about what all these world leaders and financial leaders must think as they watch others hard earned life savings vaporize due to the global financial corruption. I then came across a blog post written by David Wolfe, a leader in the raw food movement, pondering what “rich” really means. His post is titled “Why I am not a millionaire”. It seems that all his savvy internet marketing has stirred up his followers assuming he is making a fortune on all his promotions of healthy foods and super foods. He took the time to explain that he considers himself a “wandering Daoist”, never accumulating many funds, teaching from passion about helping others and that is what makes his life rich. It stimulated me to reflect on what brings me joy and makes me feel “rich” at this moment in time. Through these reflections, I realized that sharing time with family, friends, nature, in quiet reflection and living in a conscious, compassionate community brings me my true joy. I also cherish being of benefit to animals and their humans worldwide. When asking friends, they shared similar thoughts. 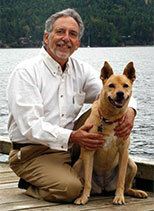 Time shared with our animal companions, whether domestic such as with our dogs, cats, horses etc. as well as wild animals that may surround our home brings a deep seated joy, independent of finances. One couple shared that in the Jewish tradition the word for “rich” is the same for inner happiness. I feel that that is really the key. I have watched hard earned savings diminish for various reasons and have experienced the impermanence of all. I realize that richness is truly in each and every moment. I reflected on the times I would lie down on my couch in front of the wood fire after a long day in freezing cold horse barns treating the horses, dogs and cats at the barn, appreciating all the animals I was able to help that day. My rescued golden retriever, shanti, would lay by my side and somehow gently figure out how to get my hand petting his head as my black and white rough and tumbled, stocky rescued stray cat , Chi, would jump onto my chest, lay down and have his diesel powered purr warm and vibrate my body back to life. I would take a deep, relaxed sigh and slowly dissolve into a gentle, warm fuzzy, blissful feeling. They would help me heal from long hours, day after day in the cold barns. To me, this is true wealth, a truly rich life. When friends visit with their dogs or cats and we all cuddle together in front of the wood fire, these are priceless moments. Sharing time with our loved ones, two-legged, four-legged and winged is a kindred spirit richness that is so luscious, beyond words. To me, real wealth includes sharing our lives with all beings. How do the times spent with loved ones make you feel in your heart? Feel that right now and appreciate this rich moment. For really that is all there is, one rich moment followed by another. It also provoked me to ponder about the way we use language. For instance, how we “spend” time, rather than experience or share time with others. It seems like the global mind training is that everything has a “price” and things must be done for profit. But what is profit? Is it only financial? I invite my readers to ponder what makes them feel “rich” during these more challenging economic times. What really brings one deep, deep, inner peace, calm and joy? Perhaps write or chat about this and show gratitude and appreciation to all those beings that bring you true inner joy and peace. When we transition from this physical form, our human bodies, what memories will bring you joy? I love the saying I once heard, “I never saw a hearse with a luggage rack”. What can we take with us as we transition into the formless? What truly makes you feel rich? For animal lovers, I continuously hear that time shared with their animal companions are some of their most joyous, rich moments. What I now call kindred spirit richness! A richness beyond words! Take a moment and express gratitude and appreciation for the kindred spirits in your lives and let them know in some special way how they make your life richer, moment by moment. Now that is real wealth! I look forward to hearing your thoughts regarding this question. 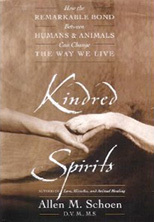 Another essential foundation of The Kindred Spirits Project focuses on how the awareness and personal experience of the interconnectedness of all beings can bring about a further evolution in the development of a more compassionate society. I have been proposing that a “trans-species field (TM) exists when different beings interact with each other. I call this the Trans-species Field Theory (TM). I personally believe this is part of the feeling of unconditional love (or not) between us and our animal companions. There are different variations on the theme of these concepts from scientist Lynn McTaggert’s book “The Field”, to Rupert Sheldrakes theory of “Morphic Fields” and Morphic Resonance. They seem to have as a commonality of resonant frequencies. It seems that everything that exists in matter has both a physical appearance as well as a vibrational frequency, a field that it emanates. When two fields interact, it like two tuning forks interacting with each other. We tend to feel more comfortable in fields that resonate with us and not so comfortable in fields that are dissonant to our resonant frequency. In previous posts, I actually posit that humans may actually be subdividing into different “sub-species” based on whether we resonate with the quieter frequencies of nature and animals or if more and more of us are resonating with the vibrational frequencies of motors and electronics. This is the basis for cliche’s like “I do or do not resonate with you”, “good vibrations”, “that person gives off good or bad vibes”, etc. These vibrational frequencies may be why some people are so agitated in cities and feel so comfortable in nature. There are an infinite number of vibrational frequencies in cities from the vibration of all the living beings, the vibrations of all the radio, tv, internet, wireless, phone, smart meters etc. bombarding our own personal field continuously. Some posit that being bombarded by all these vibrational frequencies may be one cause of “dis-ease”, the lack of ease that we feel when we are in dissonant fields. Interestingly though, there are some people that seem to have adapted to living in the midst of all these fields and feel uncomfortable when just being in nature. They seem to be actually more comfortable in the midst of all the hustle and bustle and all the fields. Other people do not seem to recognize that they are vibrating differently when in a city, they simple feel more irritable, impatient, angry, frustrated or other emotions that can manifest when we are not in a place of inner peace. There are smaller and larger resonant fields. Different species are a manifestation of their species resonant field. I feel that there are new continuously evolving fields when different beings get together. I find that each place where humans and animals interact creates their own “trans-species field (TM) whether it be a horse barn, animal shelter, animal hospital, zoo etc. That may be why one feels quite different in different places of human animal interactions. Do you notice that in different places where you share time with animals? How would you describe that? This is the basis of my trans-species field theory. My theory is that the fields emanating from each living being interact when they are in more intimate contact and that each field influences the other and creates this new “trans-species field”. For example the more you around your kindred spirit, the more the two of you resonate together. Many people observe that they and their dogs, cats, horses or other animals begin to mimic them, act like them and be like them in general. Now, some of that may be simply due to our animals being excellent observers of human behavior and mimic us in their own way, or it may be based on mirror neurons in our brain or may be due to resonating energetic fields. I feel it may actually be a combination of all these possibilities. The exciting implications of these theories is that the more we become aware of the science of interconnectedness and experience how deeply we are all interconnected, we can become more sensitive and aware of how our thoughts, emotions and choices can positively impact on all other beings. When we are not aware of all the amazing connections continuously unfolding between all of us and mother earth, we just go about life doing our own thing and not feeling we can have any positive impact on what is happening in this wild and wondrous world. On the other hand, once we are aware of all these awesome connections, we can rejoice and appreciate how our choice of emanating loving kindness and compassion to all beings can actually create a happier, healthier world! May we all emanate Happy, healthy, loving fields to all beings! A friend sent me this photo essay going around the internet. I found it incredibly touching. Personally, it felt like it was a demonstration of intelligence, trust, and nonverbal communication between species that was perhaps the way it used to be, prior to so much division and fear having developed between humans and other animals. It was heartening to see how the fisherman and his family assisted them. It is a promising illustration of how perhaps we can all help each other in the midst of the global environmental challenges we are confronting in 2012. Perhaps we can all use this as a healthy, joyous reminder of how we can help all beings in need beyond all labels of species, predator, prey, us vs. them, self vs. other. We can all support each other in creating a more peaceful world in 2012! Amazing story…a miracle of sorts, really! The Best Day Of Fishing Ever! “Once the deer reached the boat, the four began to circle the boat, looking directly at us. We could tell right away that the young bucks were distressed. I opened up my back gate and we helped the typically skittish and absolutely wild animals onto the boat. In all my years fishing, I’ve never seen anything quite like it! my boat, the Alaska Quest. We headed for Taku Harbour. Once we reached the dock, the first buck that we had pulled from the water hopped onto the dock, looked back as if to say ‘thank you’ and disappeared into the forest. After a bit of prodding and assistance, two more followed, but the smallest deer needed a little more help. My daughter, Anna, and son, Tim, helped the last buck to its feet. Thank you for sharing these photographs and story with all of us! A client and dear friend forwarded me this wonderful New York Times opinion article written by a favorite author of mine, Pico Iyer, from December 29, 2011 titled “The Joy of Quiet”. My clients comment to me after reading the article, was: “As I sit quietly at night, with the only sound in my home being the breathing of my asthmatic cat, who knew that I had gone from dinosaur to cutting edge chic?” I feel like this amusing, but truthful article is an appropriate beginning blog post for the New Year as silence and quiet time in nature are a key part of the foundation of the kindred spirits project. My friend also commented “I thought this would resonate with you”. It did indeed. I felt like Pico personally endorsed and reaffirmed my own decisions and that perhaps, I no longer needed to consider myself a dinosaur for choosing to live on a quieter, more remote island, living a more peaceful life with less nonstop connection to the outer world. I chuckled as I read it and thought, oh, I am not the only one who has made a conscious choice like that. Cool beans, my choices are now becoming chic for a new generation!